In 2007, Donna Franklin started as a volunteer with Project Home. 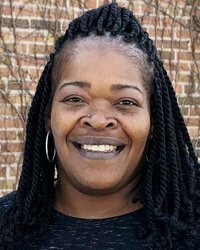 She so enjoyed connecting with the parents and helping with the children, that she became applied for a Site Coordinator position in February of 2008 for a Site Coordinator. In 2016, Donna was promoted to the Senior Site Coordinator position. As a Senior Site Coordinator, she is responsible for the day-to-day operations of one of the two family shelter sites. She enjoys coordinating volunteers, making sure our guests are comfortable, and providing healthy snacks. Donna loves working with Project Home. She enjoys meeting new people, including all of the wonderful families we serve and the caring volunteers we work with. She can find something in common with almost everyone she interacts with on a daily basis. Donna was born and raised in Illinois and still goes back to visit family. She enjoys music and reading. She’s a member of Community of Grace Lutheran Church in White Bear Lake and lives in Vadnais Heights.